Capture stunning footage of elusive wildlife with Browning's Recon Force FHD 10MP Trail Camera. It takes crisp 10MP images and records incredible 1920x1080 full-HD video with sound that can be played back on a 60” TV without losing clarity. With a 55-ft. detection range, the infrared flash illuminates game up to 100 ft. away without spooking them. Zero Blur technology snaps nighttime photos in under a second, virtually eliminating motion blur from moving animals. Also features time-lapse mode. Can take up to eight multi-shot images or up to eight rapid-fire images. Programmable picture delay from five seconds to 60 minutes. Displays time, date, temperature, moon phase and camera ID. SD card slot accepts up to 32GB (sold separately). Uses eight AA batteries (not included) or 12-volt power jack. Includes Browning Buck Watch Timelapse viewer software. 5”H x 4”W x 2.5”D. 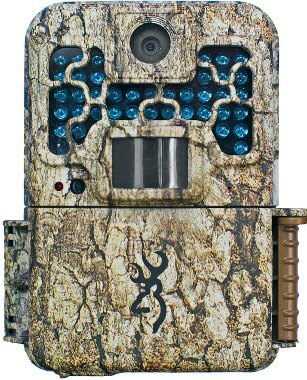 For more information, please visit //www.cabelas.com/product/browning-174-recon-force-fhd-10mp-trail-camera/.